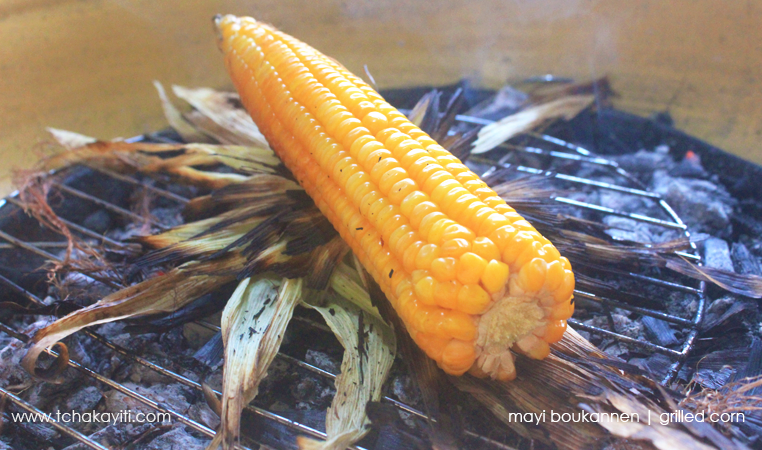 As you may already know from reading my mayi boukannen or bouyi article, growing up, there was nothing quite as fascinating to me as standing by a charcoal grill while some mayi boukannen was being prepared. A mixture of anticipation and excitement at the thought of the feast that was sure to follow kept me by the fire. I would watch as the charcoal lit up and pay close attention to the soft flames as they grew in intensity wrapping the unpeeled vegetables with their smoke. The resulting heat would gradually cook the kernels hidden under the husk that turned charred over time, a sign that the corn was ready to be peeled and transferred to the grill where the cooking process would be completed. 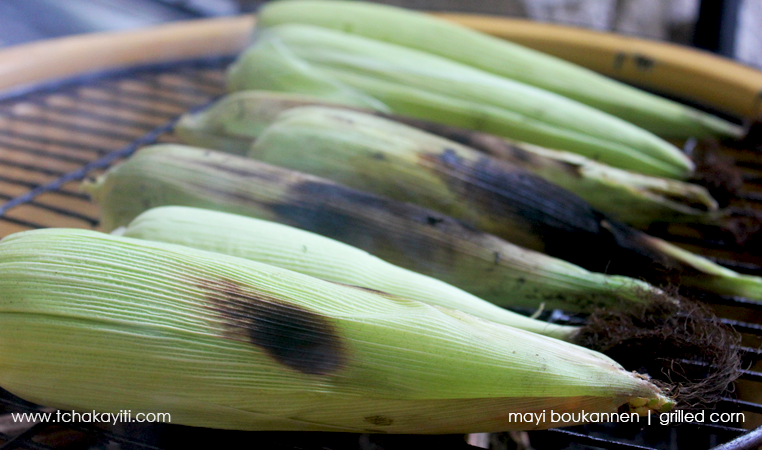 I waited rather impatiently as the husks turned charred, at which point we peeled the corn, dusted off the “bab mayi,” (silk) and put them back on the fire to get some grill marks on the corn ears and attempt to make some popcorn. Yep, I went as far as requesting that they let some of the kernels pop. I was that anxious to relive my past. Unfortunately, this time around we only got two kernels to pop. Yet, I was still happy to get a taste of my childhood, a mayi boukannen permeated with the aromas of its own husk and silk, a sweet juicy smoky mayi boukannen. I am not sure why they no longer use this method, but my corn grilled in its husk had a bolder flavor and was definitely juicier than the ones cooked directly on the grill. All things considered, I was happy to relive my past that night, and I definitely encourage you to make your mayi boukannen the old-fashioned way. Your taste buds will thank you. De belles photos qui nous convient a nos BBQ!